I have been a member of twitter now for about 3.5 years. When i first heard about it and heard the usual “im eating a sandwhich” style stories, i always thought, ill never join. Well I did, and now, i’m definately and avid tweeter. It has become a large part of my life. But it is people I know who don’t use twitter always ask “why?”. Well Twitter is a massive tool in helping people communicate but it also can help people meet others, gain new friends, but one thing lately it has been able to do is help solve problems. We recently had an issue with some flights at work and was trying to track down a sales contact. So I did what so many people I follow have done. I tweeted the airline to their social media team. this was about 4pm on a Friday afternoon. I got a response within 20 mins and we had the contacts email first thing monday morning! I also recently had some problems with the move to my new apartment. A few tweets, a direct message from them and the situation was resolved… to my benefit! I could not believe it! (full details of the move to come). It has been amazing meeting so many new people around the world via the power of twitter. I have had blog posts syndicated out to other sites, met new friends in other countries as I travelled around the world and now I get to enjoy the power of twitter here in Seattle as I get around the city with recommendations from fellow twitter users. It has gone from a way to tell people what im doing, to interacting with others and also a way of connecting people to the world, to help solve problems and get things done! Okay so I need to stop finishing books in a week or picking bigger books. 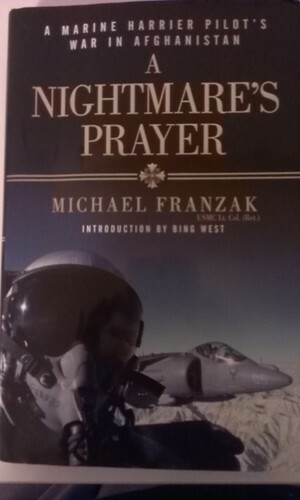 The book is A Nightmares Prayer by Michael Franzak. I ended up with this book in my pile from one of my many amazon book binges. The book follows the author who is a United States Marine Corp (USMC) pilot flying the AV-8B Harrier. It specifically covers his time during his deployment to Afghanistan as Executive Officer of VMA-513. For those that don’t know the AV-8B is the US variant on the venerable British made Harrier. The Harrier was the first VTOL (Vertical Take Off & Landing) fixed wing aircraft. Later modified and mainly used as STOVL (Short Take Off Vertical Landing) the Harrier is unique in the combat aircraft world. The USMC is one of a handful of operators in the world and is used as a Close Air Support aircraft covering Marines and soldiers in the field giving them protection from the air. 3. It was not very in depth about the aircraft but more about the human mind, how it thinks, reacts, feels. Even though the book was not as I expected I was glad it didn’t really cover the aircraft as much. I usually prefer a book that covers part on the aircraft over the person behind the controls but this was different. This book made it feel more real (even though the events happened in 2002/2003), like I was the pilot. Very glad to of bought this book with me, it was definitely what I needed to bring some things in life into perspective and also help rekindle that love of Aviation that I have. A good read for any Avgeek like me. Not much content right now for the site as I’m currently in the process of moving hosting from Australia to the USA so posts will be a bit sparse, but I am alive and well. Crazy busy at the moment as I move into my apartment on Saturday, which means Mal has plenty to do and not much free time to do it in. The shopping has been mostly finished with some bits and pieces still to get, but it’s only small stuff or stuff I get with the normal weekly shop. Stay tuned lots to discuss with the move. Hilarity almost guaranteed with the shopping adventures and trying to set up the apartment for sure. So as most aussies back home know, Costco is just starting out down in Australia. Well what you probably don’t know is that Costco is a Seattle based company. They actually started about 5 or 6 miles from where i work. The original store is still there!! I figured it was about time i hit up CostCo, and if I was going to do it, I was gonna do it right! I was gonna hit it up first thing on a Saturday morning with the hordes, and I was going to visit the very first ever CostCo. Now you need a CostCo card to enter the building (thankfully work has one) and I managed to score it for the weekend. It wouldn’t let me buy anything as apparently they are id’ing at the checkout lately. But if i decided I wanted to buy, I could just sign up and fork over the $55 fee. So i rocked up nice and early, right on opening time (and was joined by Clare my friend from work who was also interested in checking it out to see if it was worth it or not). It was pretty bedlamish as people were flowing in straight away. It kind of felt like an Ikea almost as by the entrance was a bit of a cafe with cheap food and definately competing with Ikea as Hot Dog and a Soft Drink… $1.50! As we explored it seemed some stuff was worth it, some was not. There was definately things that were a little to big like Washing Detergent for your laundry. For a single person a bottle that does 110 loads is definately not worth it, thats seriously almost a years worth! I dont need that much! There was some good deals on brand name tvs, and watches and stuff (hell you can get phones and diamond rings) but to be honest, those tvs can be matched elsewhere (like Frys… but thats a story for another day). The biggest savings are on booze in some instances (now that Washington has changed their liquor laws) and on the fresh/Frozen food. Speaking of food, around 10am the samples come out, and so do the people. As they start offering out the samples the hordes come from no where all clambouring for some free food. It was a little more like bedlam around the food area during this time, but a quick exit and I was ok! Did I buy anything, nope. Is it really worth me getting a membership, nope. If I was going to buy anything I would just tag along with whoever goes from work and as Clare put it “hit the road for a Costco Run!”. This way I don’t have to fork out for the $55 a year for something that probably wouldn’t save me all that much per year. If I had a big family, that would be a whole different story, but I don’t. It was still fun though, do you think I could eat 10lbs of Rolled Oats? Another book already… yeah i know! This book is Diary of a Legionnaire by Gareth Carins is the latest book for me to finish. Albeit very quickly after the last book, but i boil that down to a few factors, travelling and long commutes in plenty of traffic (that and its not that thick of a book). 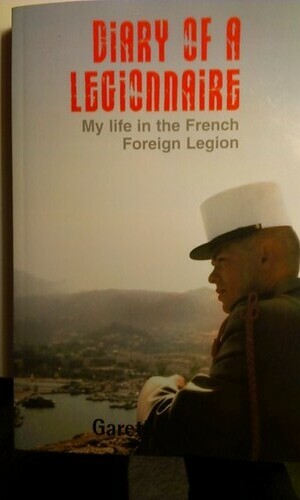 The book is an autobiography of the author who served 5 years in the French Foreign Legion. For those that don’t know, the Foreign Legion is one of the divisions in the French Army. An entirely Volunteer force of men from all over the globe, those wishing to escape their pasts and start a new life. Pretty much at the end of 5 years you will have a brand spanking new life! You commit to a 5 year contract and if you dont fulfil it, jail for you buddy! Gareth served with the French Foreign Legion’s (FFL) Parachute Regiment. Kind of like the elite of the elite. The FFL has always had the kind of allure to me, that exotic attraction of being given a new life, a new identity and being able to just get rid of all your past. What I didn’t realise till this book was just how much they follow their traditions in the FFL. They are extremely traditional, extremely different and extremely brutal. The book covers some of the brutalities that just become like a normal life for the soldiers. The beatings, the treatment by superiors all just seems way to unlike what I had expected and in fact totally changed my mind on certain things. Would I ever join the FFL…. not anymore!!! A good read for those who like these kinds of books (like me) for something a bit different, to show the side of men who want to change their life entirely and start a whole new life somewhere off in this great big brown earth. I had been having a bit of a rough time in life and had decided it was time for a getaway, flights were pretty expensive at the last minute to anywhere really and I wanted to try and get some stays for the Club Carlson promos done and out of the way. So I was hunting down a Park Inn and found either a few options in Texas (but flights were a no go) however there was one in Vancvouer! Awesome. I could get the stay done, visit some friends and it would be a quick trip. Originally had planned on driving till I found some stuff on Bolt Bus. Bolt Bus is like the Low Cost Carrier of Greyhound (if that was possible). In reality they are more like an express service. They had only just opened up services in the Pacific North West. Fares were cheap! I also managed to get a great deal on a 2nd night at an amazing hotel (but I shall leave that to later). Plans were set but no bookings were made. Weather did not look good, so the plan was to hold of as long as possible. This would be a very spur of the moment trip, definitely not me. Thursday morning, weather improved, it was looking passable. I pulled the trigger and booked it all. I was set to head north! Finished work on a high note thanks to figuring out a very complicated itinerary and getting something to fare so I was extremely happy. I just missed the bus to Downtown as I needed to make my way down to the King Street Station area. So after waiting around and still unable to find any information on any lockers at King Street Station (there aren’t) , I caught the next 550 to Downtown. Damn was it a long long journey. Almost an hour! Wasn’t able to read, as I only had the Spinner suitcase it rolled around way to much on the bus and had to spend the whole time holding onto it on a very packed bus going stop start for almost an hour.. not a good way to have your mood go from good to frustrated. Frustration got a little bit worse when I finally got to King Street Station as there was not a single sign for Bolt Bus anywhere! It was still about an hour till the bus so I figured I could get some dinner at Uwajimaya (conviently opposite the station) and pick up some supplies for the journey. After checking out the shops for a little bit and picking up some weird Green Tea Cookies (that were yummy by the way) and some water I managed to grab some dinner and after rushing to finish it before what I thought would be the time I would need to be there for the bus. I rocked up back to the street around 730 for an 8pm bus figuring I needed to be there. WRONG!!! Bus was no where in sight, no one was in sight at all. There was literally nothing to even tell me if I was in the right spot. As time went by more and more confused travelers stumbled around all asking the same thing “Is this the stop for bolt bus?”. This is obviously not a good sign for Bolt Bus at this stage. Even a sign would have been a good thing. Eventually about 7:55pm the Bus rolled up after a fight almost broke out at the dodgy looking pub across the street. Damn the driver for taking away our focus on the entertainment. Almost the entire bus emptied off and a large crowd was gathering around the bus by now. From here the driver went through his speel. Boarding by Groups on your boarding pass. Make sure you have your passport out and open and feel free to sit wherever you want. Thankfully I was in the A Group even booking the day before so that was a good thing if you ask me. Maybe the closer you book you get a better boarding group? Who knows. But I dropped my suitcase underneath, lugged the camera bag up into the bus and took the customs form off the driver. Onboard the bus it looked good. Bolt Bus has only been around a few weeks in the PNW so the bus is obviously still pretty fresh. Leather seats, power points at each row, plenty of leg room and free wifi onboard. Definitely a good thing if you ask me. All it really needed was a Tray table for laptops and it would have been perfect. Wifi was active straight away, powered up and logged in, I didn’t even realize we were on the way. We probably pulled out about 5 minutes late. To be honest this was great. I had the time to settle down and get through all the emails and stuff I had put off for 2 days and catch up on life a bit. By the time we reached the border I had seen a beautiful sunset, enjoyed finishing off some snacks and then had also spent the time chatting with friends as well. At the border your informed the Wifi probably wont work after that point, so good to get any stuff you want done before the border (or after it on the Southbound). We arrived the border at around 10:05pm really about 5 mins behind schedule so can not complain. I believe Bolt Bus allow approximately 30 minutes for the crossing but I have heard stories of buses taking over an hour. But this was good. We were running on time really and the border crossing was a non issue. A number of questions grilled by Canadian Immigration (same as last time but not as bad) and I was greeted in for the weekend with a stamp.. yay! Back on the bus and on the road around 10:35pm so only 30 mins! Awesome! Book out, last few messages out before the Wifi dies and as we power north to Vancouver I chill out. Next thing I know after tuning out we are in Vancouver, rolling into Pacific Central Station at 1135. That is definitely good news, only 5 mins behind schedule the entire way! Jumped in a taxi at the Station and I was at my hotel just minutes later. I had booked Friday night at the Park Inn & Suites Vancouver mainly to get their promotion stay where I can get about 44,000 free points with a 1 night stay. Would I stay here normally, nah I would stick more downtown. But I was not worried all that much. The rate was fairly good, I would get a room upgrade thanks to now being Carlson Clubgold thanks to a status match and I wasn’t going to spend all that much time at the hotel. Check In was a bit slow with lots of paperwork required (more than usual) but eventually I was handed a “Letter” and directed up to my room on the top floor. I had been upgraded “according to the registration sheet” to a King Vancouver Vista room (possibly a business class room not sure) but either way the room was good. Didn’t see much that night as I was in bed, 10-15 minutes later. Woke up and the weather looked good, the view was amazing, just stunning, so decided to go for a run along the Seawall. After some quick directions down the Seawall and stuffing up my run tracking (yep im that retarded) I had a good run along the waterfront along False Creek. Felt good! After a slow morning of finding out the blog was offline, reading my email updates and general goofing around. I headed off to get some currency exchanged and then the first hit for the weekend of Tim Hortons… Conviently across the street! After grabbing some breakfast and chilling out for a little while catching up on life, it was time to hit the road and get out to the airport to meet my friend. Leighton was kind enough again to take me spotting for the day and I was looking forward to a relaxed day without much else to do. I packed up all my bags and strolled on down to the Broadway Skytrain station. This station is on the Canada line which runs directly to the airport so I didn’t have to spend the time playing change trains to get out there while toting a suitcase. Why dragging my suitcase? Well I had managed to score a room at the Fairmont Vancouver Airport for an insanely cheap deal. VERY VERY cheap rate. $69CAD for the room. For an amazing hotel, at the airport itself, I couldn’t believe it! So I jumped on the train and 20 minutes or so later I was jumping off at the airport and strolling my way over to the Fairmont. The one thing I love about the Fairmont at the airport is that it looks super modern just like the rest of the airport but there are certain little things that keep it in line with that Chateau styling of the Fairmont brand. You actually enter the airport itself and then head to a level above the check in facilities to the reception of the hotel. Being 11ish in the morning I did not expect to get access to a room, the plan was to drop bags and head straight off spotting. But the hotel had a room ready for me so I headed on up. There was a few issues with Wifi reception so the room I was originally in, was swapped for another room but the hotel was more than gracious. In fact their service was fantastic!! I could not fault this hotel, large spacious rooms, lovely luxurious beds, big bathroom, the only downside was a lack of power outlets (a common theme). Big picture windows overlooking the US Flight ramp (in the 2nd room) and I was in heaven! But no time to waste! Spent the afternoon chatting, spotting, taking photos, eating, drinking (had lunch at the Beaver Bar which was fantastic as always). I enjoyed the day so much I lost track of time as by the time I got back to the hotel it was almost 5pm! There was a lovely little gift waiting for me in my room and the choc coated strawberries were delicious! I could get used to this. With more time spent taking photos from the room, I eventually headed downtown for dinner after not being able to make up my mind what I wanted. The night was a bit mixed, with my usual self getting in the way. Managed to get lost, not look into things better and after not being able to make up my mind had part of my dinner at one place and finished it off super super late back at the Fairmont after a stop at the Whole Foods on Broadway… not my finest moments! The morning was spent with a gym session where I could have been on the internet on the exercise bike (it didn’t work though which is probably a good thing), cleaning up the absolute destruction I caused last night in the room and just generally relaxing while taking more photos. I had been woken up by an offending Dash 8 spooling up to full power right outside my window. I guess sound proofing just cant block a full power turbo prop. Either way I didn’t mind. After a stroll through the airport to Tim Hortons down at the Domestic Terminal, with a good view of the runway and the taxi ways I enjoyed more time catching up on life with photos and some Tim Hortons. Made sure I was back in the room for the Asian arrivals of JAL, China Eastern and the Air Canada from Tokyo and the Air Berlin flight from Dusseldorf. With the active runway for the Heavies right next to my room, it was a good way to finish off my stay at the Fairmont as I would eventually have to leave ? Made my way back to the Skytrain (I had pre bought my ticket at the 7-11 after yesterdays costly mistake) and headed into the city. I made my way over to Pacific Central Station to drop my bags in a locker then reversed my journey back to downtown to spend some time doing a bit of shopping. I figured that if I could find a jacket the last time I was in Vancouver for cheap when I was desperate, it may work a 2nd time. It did. I did a fair amount of exploring, hitting up wherever I could find (even heading back over to West Broadway.. thank you to the North Face Shop on West Broadway for their tip) but I am now the proud owner of a lovely warm North Face jacket, one that will keep me warm and dry during the Seattle weather! After some shopping and wandering and aimless nothingness I hit up Japadog for a Kurubota hot dog Japanese styles (YUMMMM) and then slowly headed back to Pacific Central station to get my bag and wait for the bus. At least this time there is 1 sign in evidence at the Bus station but since Vancouver is the terminus you aren’t going to miss the bright red buses. Again boarding was done via 3 groups (A, B & C) but the drive had everyone line up so there was some order to everything. This was a bit out of place compared to Seattle but maybe this is how its meant to be done. Either way I was in the A Group with 2 other people. There was a very very small group this time, maybe 12 or 15 max. So we boarded and were gone right on time. The road out was quick and there was not much traffic on the road so we made really good time to the US Border. What was even more impressive was the quickness of the processing. No hassles only a few questions this time (compared to entering in LAX) but to be honest it was a quick stop and we were on the road before we were even meant to be arriving at the border. This meant 2 more hours south and we would be in Seattle early!! The wifi signal kicked in about 2 minutes after the border, so this is good timing as that’s how long it took me to get everything sorted! With Wifi up and running and my phone back out of Canada roaming o it felt good to be back in touch with life! We flew down the Interstate as there was very very very little traffic and it was as though the day was just for us. The sun was out, I had wifi, and as we approached Seattle a magnificent view of Mt Ranier (which I couldn’t get a good shot of). To be honest this was a great way to end the trip. We got in 30 minutes early (how often can you say that on a flight) and within 10 minutes or so I was getting picked up and ferried back to the apartment after promising a box of Tim Hortons donuts to someone. Easy as pie! Absolutely loved the weekend. Some definite highlights and one or two low lights but that’s the way it always goes. The weekend was definitely successful in what I had intended on it doing. Getting me reinvigorated with life. It was great to spend Saturday with a mate and get to catch up on life and have a good afternoon where you can switch off and not worry about a thing. Bolt Bus was definitely a fantastic thing and I will definitely use them again. It is silly to drive to either Portland or Vancouver with tickets so cheap, seriously cheap!! They are bargain fares but your not getting bargain service out of it. My only suggestion to them is some form of sign at the Seattle stop so people don’t mill around so much. 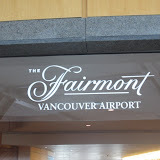 The Fairmont Vancouver Airport… well what can I say. I am in love with this hotel. Amazing people, amazing service and to top it all off… the location and the views. Found out this morning that I could of borrowed a BMW bike which would have been cool and next time I stay there I most definitely will take advantage of that and go for a ride somewhere. The hotels views were just stunning in my opinion and the airport has a lot to offer (the food there isn’t all that expensive in the main terminal either! So you don’t really need to head into the city for a decent feed). Plans are afoot for another trip north, but for now I am ready to hit the streets for more adventure in life! The last 24 hours have been pretty rough, but i know that it is a far cry from what some people are feeling back home. Some pretty tragic news came to light last night that seemed to have forced some issues home. I had been dealing with some personal stuff (as eluded to on Friday night) but to be honest, this all means nothing now. The petty things that have been going on in my life lately are now essentially nothing to me. I can’t let that crap dictate my life, or get in the way. I need to make sure that I try and keep those friendships that I cherish, do everything I can with it all and savour each moment that I can. Even if this means giving up the way I feel at times and doing the right thing instead. My thoughts and prayers go out to the people back home (you know who you are) who need my love, care and affection right now and I can’t be there to give it. Last night managed to hit home very very hard making me feel very very alone for the first time. Something a lot of people will say “your not alone” but to be honest, its not the same. But I will take what I can get. A conversation with a friend, a kind word here and there, a warm look, a smile from a random stranger. It all helps to make things just that little bit easier. Right now I will keep pushing forward, try to keep myself focused on the job at hand, to keep my self moving forward and live my life as much as I can each and every day! A book that one of the movies that appeals to me is based on, yeah I should read it. The book is Up In the Air by Walter Kirin. This is the original book that Up in the Air the popular movie amongst points fanatics/avgeeks is based on. The movie had George Clooney in it, was about a guy who fired people for a living and was aiming to get like 7 Million Frequent Flyer miles with American Airlines. The book is similar, yet not. Yes it is about a guy who fires people for a living, who is aiming to get just 1 Million frequent flyer miles, but to be honest, that’s about all that is similar. This book was very confusing, at times it chopped and changed and didn’t make any sense, it didn’t track along with the movie at all and frankly I was extremely dissapointed with it. The movie was adapted and changed to be more easier to understand and follow, and I actually kind of regret reading the book. But that is what you get when you want to read a book to movie adaption. Depending on what you see first will determine if ou think it has been done so well. In this instance I probably shouldn’t of read the book. The movie is great and I love it, but the book was just so confusing and dissapointing that it kinda makes me sad. Onto another book anyway to make the bad feelings go away! June 10, 2012 by Mal·Comments Off on Reflections. I have had a rough last few days and have been thinking a little about what I have accomplished over the last few years. I was a little bit saddened by some things but yet the last 12 months have been pretty amazing. I won’t go into what caused the problems or why I had been thinking like this but while I cruise north on the bus, heading away from?? You problems I figure it’s as good a time as any to maybe just talk about it. On the last 3 years I have changed myself so dramatically that sometimes I am not sure which parts of me are new and which is old. Not sure what belongs to the old mal and what is the new. Somewhere in this head of mine I try to comingle the two and hope something works out. Who knows what will/won’t. I take each days as it comes right now, each day a new adventure. Not sure what to expect but all I can say is that each day brings with it unique challenges. Sometimes I wake up ready to take on the world but within hours I hate life. Yet other days it is the other way round. There are small things lately that makes me smile. A glimpse of my truck, the sunsets over the Cascades or a glimpse of the Olympics as I walk back to the apartment. Lake Washington by my side on a run or seeing Seattle off in the distance. I love it over here yet times I am really sad or homesick. It makes me wonder why I did this sometimes but I will make sure I enjoy it while it lasts to take advantage of everything. I will make the most of every single day I get over here. I don’t know if I ever want to come back. My 3rd book here in the USA is pretty appropriate. 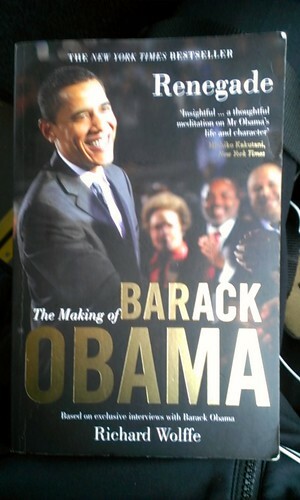 The book is The Making of Barack Obama by Richard Wolffe. I didn’t buy this book cause I was moving here, this book was purchased long before the offer to move here was made. What happened was it was cheap, so I bought it. When I moved here though I figured it would be an appropriate read so bought it with me. The book follows the President through his campaign and the primaries and follows his journey to becoming President. It’s not a detailed look into his life but more tracks what shaped the man and how it affected him in the process. I learnt a lot while reading the book. It delves a bit into his past, about how he grew up and how that shaped his life. How his mother had him living overseas with her and introduced him to a different perspective on life. What is interesting is seeing into the man himself, learning why the secret service game ever him his, code name of Renegade. It truly described his nature and how it showed his way at looking at life. He did things people told him he couldn’t, what they said he wouldn’t be able to accomplish.